Amsterdam is known for museums, nightlife, parks, breweries & distilleries, and shopping. Your plan includes some of its best attractions: admire the masterpieces at Van Gogh Museum, pause for some serene contemplation at De Duif, indulge your thirst for a good beer at Heineken Experience, and stroll through Vondelpark. To see more things to do, ratings, photos, and tourist information, refer to the Amsterdam trip itinerary planner. Vienna, Austria to Amsterdam is an approximately 4.5-hour flight. You can also do a combination of flight and train; or drive. While traveling from Vienna, expect little chillier days and about the same nights in Amsterdam, ranging from highs of 15°C to lows of 5°C. Finish up your sightseeing early on the 27th (Sat) so you can go by car to Bruges. Start off your visit on the 28th (Sun): don't miss a visit to Oude Griffie, contemplate the long history of Historic Centre of Brugge, then admire the masterpieces at Groeningemuseum, and finally indulge your thirst for a good beer at Huisbrouwerij De Halve Maan. On the 29th (Mon), you'll have a packed day of sightseeing: examine the collection at Choco-Story - The Chocolate Museum, make a trip to The Markt, contemplate the waterfront views at Minnewater Lake, then admire the landmark architecture of Basilica of the Holy Blood, and finally don't miss a visit to Belfry of Bruges. 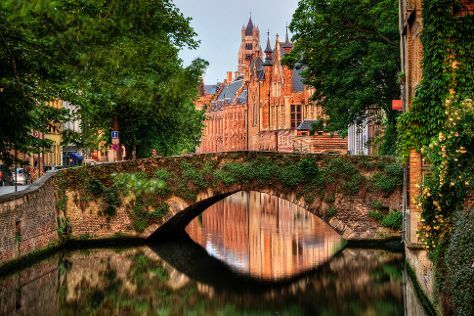 To find where to stay, ratings, other places to visit, and other tourist information, go to the Bruges trip itinerary planning site . Getting from Amsterdam to Bruges by car takes about 3 hours. Other options: take a train; or do a combination of flight and train. Expect a daytime high around 15°C in April, and nighttime lows around 5°C. Wrap up your sightseeing on the 29th (Mon) to allow time to take a train to Brussels. Brussels is known for historic sites, museums, nightlife, shopping, and theme parks. Your plan includes some of its best attractions: contemplate the long history of Grand Place, examine the collection at Belgian Comic Strip Center, admire the striking features of St. Michael and St. Gudula Cathedral (Cathedrale St-Michel et Ste-Gudule), and browse the exhibits of Atomium. To see other places to visit, maps, and tourist information, you can read our Brussels trip app . Traveling by train from Bruges to Brussels takes 1.5 hours. Alternatively, you can drive; or take a bus. In April in Brussels, expect temperatures between 15°C during the day and 4°C at night. Wrap up your sightseeing on the 2nd (Thu) to allow time to travel back home.